We have a variety of specialized equipment to locate and un-plug septic drain lines. With our 50 plus years, comes a knowledge of a wide range of septic systems. We sport a BCIN licence under the new Building Code. We offer assessments of existing septic systems for the purpose of home additions or renovations and sale of the home. We have a collection of specialized equipment to assist in locating and un-plugging drain lines that can be found under Speciality Items. 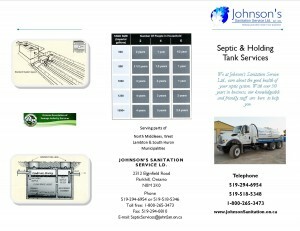 For a free copy of our Septic Services pamphlet in a printable PDF format “click here“. Our driver carries service reminder stickers and a booklet on how to maintain a septic system (It’s In Your Back Yard), free upon request. 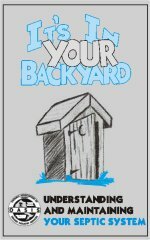 How does my septic work? The purpose of the septic tank is to separate the solids from the liquids in the wastewater stream and to begin the process of breaking down contaminants. The septic tank can be constructed of concrete, steel, fiberglass or polyethylene and can range in size from about 2300 litres to 5000 litres. To give you an idea of how large this is, consider that up to 200 litres of water fit in a standard bathtub and ordinary toilets use up to 20 litres per flush. The septic tank typically has two chambers. The waste water from your house, called “influent”, enters the first chamber and its velocity slows so that the heavier solids can settle out of the chamber, and the lighter materials can float to the surface. The accumulation of settled solids at the bottom of the tank is called “sludge” and the lighter solids (greases and fats) which form a mass on the surface of the liquid in the septic tank is called “scum”. In between the sludge and the scum is liquid waste. Microorganisms, like bacteria, and other natural processes act to decompose the waste materials in the liquid waste. Sludge and scum are also digested and compacted into a smaller volume. This is the first step in the process of purifying your household waste water. When the first chamber of the tank becomes filled, the liquid waste begins to fill the second chamber. The chambers of the septic tank are designed to prevent the movement of sludge and scum to the second chamber, allowing only the movement of liquid. Once the second chamber is filled, as more influent enters the first chamber, an equal amount of partly treated liquid flows into the second chamber, while an equal amount flows out into the leaching bed. The water flowing out into the leaching bed is called “effluent”. The purpose of the leaching bed is to further treat the wastewater. A grid work of perforated pipes or clay tiles in the leaching bed area evenly distributes the effluent over natural soil or imported fill. Sometimes a distribution tank is used at the head of the pipes to more evenly distribute the effluent to the pipes. The perforations in the pipe allow the effluent to escape to the soil. As the effluent filters through the soil, micro-organisms in the soil digest and remove the remaining impurities (such as suspended solids and/or bacteria). Eventually, the purified water reaches the ground water. 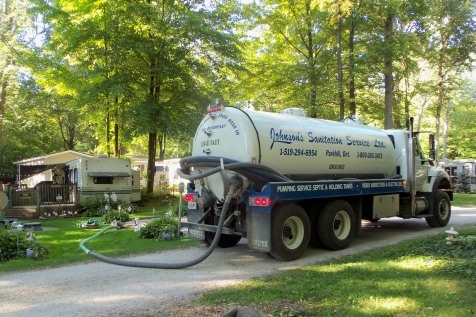 As you can see, the operation of your septic system is fairly automatic and can work quite well by itself with very little maintenance required by the homeowner. Note the key words though, “little maintenance”, not “no maintenance”.